State lands • Canadian company to develop PR Springs into nation's first oil-producing mine. (David Self Newlin | The Salt Lake Tribune) Lionel Trepanier fills a water bag from a spring at the PR Springs campsite in eastern Utah. 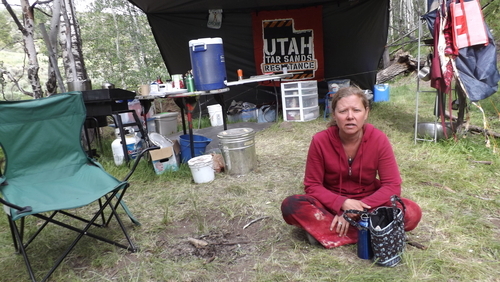 Utah Tar Sands Resistance is camping at PR Springs in what they call a permanent "protest vigil" in an effort to stop development of tar sands in the area. (David Self Newlin | The Salt Lake Tribune) Utah Tar Sands Resistance is camping at PR Springs in what they call a permanent "protest vigil" in an effort to stop development of tar sands in the area. 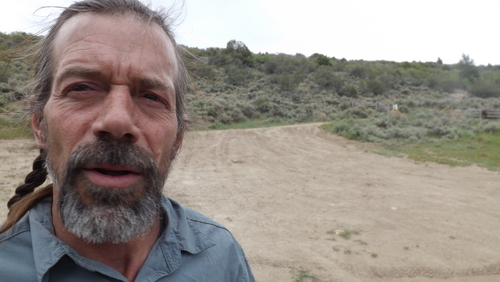 They refer to their latrine outside the camp as the "Dirty Herbert," in a sardonic reference to Utah Gov. Gary Herbert. 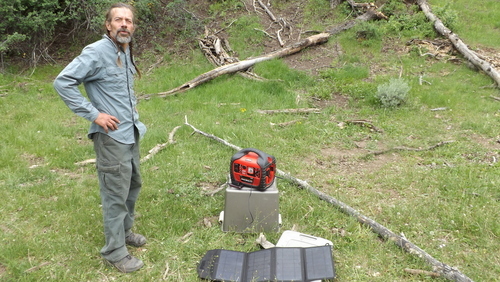 (David Self Newlin | The Salt Lake Tribune) Lionel Trepanier next to a portable power source charged using solar power. 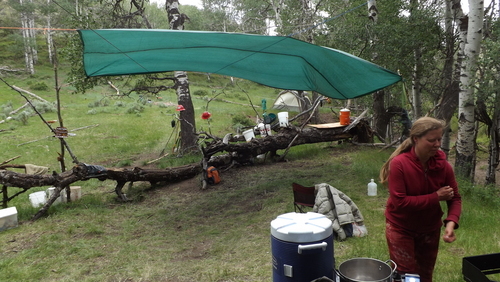 Utah Tar Sands Resistance is camping at PR Springs in what they call a permanent "protest vigil" in an effort to stop development of tar sands in the area. (David Self Newlin | The Salt Lake Tribune) Lionel Trepanier, a member of the Utah Tar Sands Resistance which is camping at PR Springs in what they call a permanent "protest vigil" in an effort to stop development of tar sands in the area. (David Self Newlin | The Salt Lake Tribune) Raphael Cordray is one of the activists with Utah Tar Sands Resistance, camping at PR Springs in what they call a permanent "protest vigil" in an effort to stop development of tar sands in the area. 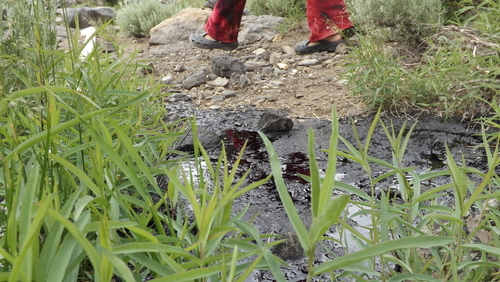 (David Self Newlin | The Salt Lake Tribune) A U.S. Oil Sands tar sands pit near PR Springs in eastern Utah. Utah Tar Sands Resistance which is camping at PR Springs in what they call a permanent "protest vigil" in an effort to stop development of tar sands in the area. (David Self Newlin | The Salt Lake Tribune) Raphael Cordray is one of the activists with Utah Tar Sands Resistance, camping at PR Springs in what they call a permanent "protest vigil" in an effort to stop development of tar sands in the area. (David Self Newlin | The Salt Lake Tribune) Tar seeping from a pile of rocks at the abandoned Bryson 4 mine, near PR Springs in eastern Utah. Utah Tar Sands Resistance which is camping at PR Springs in what they call a permanent "protest vigil" in an effort to stop development of tar sands in the area. 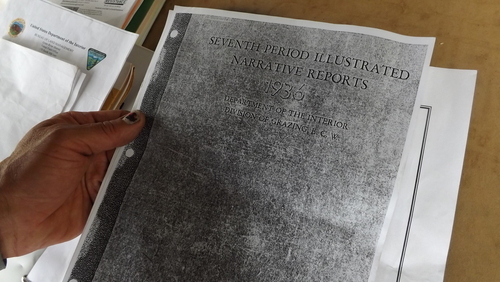 (David Self Newlin | The Salt Lake Tribune) Lionel Trepanier looks over a copy of a1936 report about the site now called PR Springs which he says shows that the department of the interior found groundwater on the site. Utah Tar Sands Resistance is camping at PR Springs in what they call a permanent "protest vigil" in an effort to stop development of tar sands in the area. 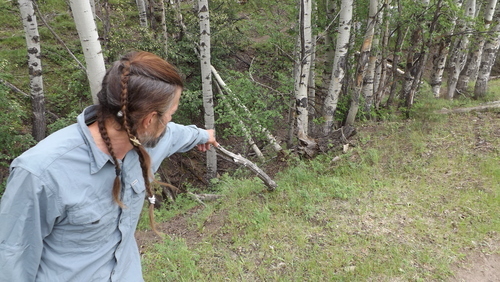 (David Self Newlin | The Salt Lake Tribune) Lionel Trepanier points to a spring at the PR Springs campsite in eastern Utah. Utah Tar Sands Resistance is camping at PR Springs in what they call a permanent "protest vigil" in an effort to stop development of tar sands in the area. (David Self Newlin | The Salt Lake Tribune) Rusted equipment sits at the abandoned Bryson 4 mine, near PR Springs in eastern Utah. Utah Tar Sands Resistance which is camping at PR Springs in what they call a permanent "protest vigil" in an effort to stop development of tar sands in the area. (David Self Newlin | The Salt Lake Tribune) Bituminous rock just outside the abandoned Bryson 4 mine, near PR Springs in eastern Utah. Utah Tar Sands Resistance which is camping at PR Springs in what they call a permanent "protest vigil" in an effort to stop development of tar sands in the area. 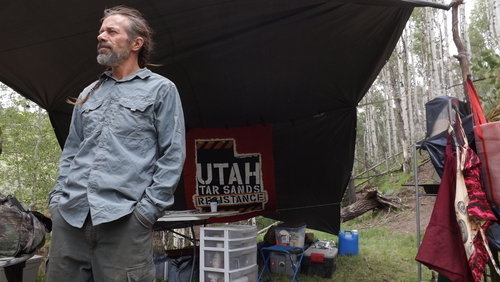 (David Self Newlin | The Salt Lake Tribune) Lionel Trepanier, a member of the Utah Tar Sands Resistance which is camping at PR Springs in what they call a permanent "protest vigil" in an effort to stop development of tar sands in the area. (David Self Newlin | The Salt Lake Tribune) Tar seeping from a pile of rocks at the abandoned Bryson 4 mine, near PR Springs in eastern Utah. Utah Tar Sands Resistance which is camping at PR Springs in what they call a permanent "protest vigil" in an effort to stop development of tar sands in the area. (David Self Newlin | The Salt Lake Tribune) Raphael Cordray, a member of the Utah Tar Sands Resistance at the kitchen area of camp. The group is camping at PR Springs in what they call a permanent "protest vigil" in an effort to stop development of tar sands in the area. 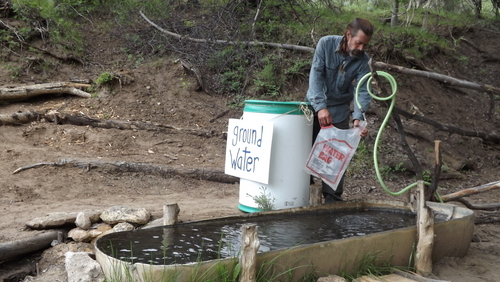 PR Springs • At a remote campsite in eastern Utah&apos;s Book Cliffs, Lionel Trepanier places a hose into an empty 55-gallon barrel that he has sardonically marked, "ground water." Water flows through the hose from a spring that was tapped some time ago. An hour later, the barrel is overflowing. U.S. Oil Sands and the Utah Division of Water Quality deny the existence of groundwater under a proposed 213-acre tar sands mine here, despite the place&apos;s name  PR Springs. This was a key finding for the Calgary-based energy company to win approval to commence mining and processing bitumen into heavy oil here as early as next year. 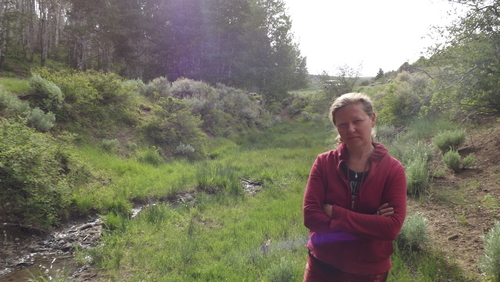 But Trepanier and fellow activists with Utah Tar Sands Resistance are quite sure water is there  they&apos;ve been drinking it for the past month while encamped in a "protest vigil" hoping to thwart what would be the nation&apos;s first fuel-producing tar sands mine. They plan to stay indefinitely if necessary, arguing Utah and the world has too much to lose if bitumen takes root. "As long as this threat to Utahns remains here, our intention is to remain here and vigil this," Trepanier said, "to do everything in our power to prevent strip mining of tar sands here in Utah on the Tavaputs Plateau." But Calgary-based U.S. Oil Sands has all the permits in place to begin work on its PR Springs lease atop 5,930 acres of state trust lands near the end of the recently upgraded Seep Ridge Road. It hopes to complete its processing plant and begin mining in fall 2015, producing 2,000 barrels of oil a day with a proprietary technology that uses citrus-based solvents to separate heavy oil from the ore, company president Glen Snarr said. The groundwater question was the subject of an appeal by Western Resource Advocates and Moab-based Living Rivers, which challenged the state&apos;s decision that the project doesn&apos;t require a groundwater permit. The Utah Supreme Court on Tuesday rejected the group&apos;s petition, ruling it waited three years too long to challenge the permit. Snarr said the company drilled 184, 3-inch test holes to a depth of 250 feet –– 100 feet below its mining horizon, or bitumen deposits –– and came up dry every time. "That&apos;s no small undertaking," Snarr said. "Our process doesn&apos;t contaminate groundwater if there was any. We use a nontoxic biosolvent, but there is no groundwater there." But environmentalists&apos; opposition to the project goes far beyond its potential impact on water. They say development of Utah&apos;s tar sands and oil shale, which underlie the southern Uinta Basin in vast deposits, pose a threat because mining and processing this ore would not only alter the landscape and leave a toxic legacy, but also consume huge amounts of energy and water. The Sierra Club has calculated that extracting just 10 percent of the oil in the Green River Formation, a hydrocarbon sea under Utah, Colorado and Wyoming, would release 48 billion tons of carbon dioxide. "These are marginal energy resources at best. You get little additional energy out for the energy you put in," argues University of Utah bioengineering professor Joe Andrade, an outspoken critic of fossil fuel extraction. "Tar sands and oil shale are in a sense like coal in that they have an enormous amount of trace metals in them. When you are processing them, you are processing the entire periodic table. Fifty trace elements need to be removed and disposed of." But Snarr contends his company&apos;s technology is so efficient that it will emit less carbon dioxide than many conventional oil and gas fields. It has little in common with the energy-intensive steam-based process used for the past 50 years to extract bitumen from northern Alberta&apos;s massive tar sands fields. U.S. Oil Sands, by contrast, will re-use hot water and solvents, thus conserving resources and minimizing waste discharges into the environment, Snarr said. Meanwhile, Utah bitumen has about one-tenth the sulphur content of its Canadian counterpart, meaning it will produce less pollution when it is refined. This could benefit Wasatch Front air quality if U.S. Oil Sands&apos; production displaces dirtier crude imported from Alberta at Salt Lake City&apos;s refineries, Snarr argued. While the company already has ordered mining and processing equipment and intends to begin preparing the site to install it, Snarr stressed officials are taking steps to protect protestors should they attempt to interfere. "We understand everyone&apos;s right to speech. First and foremost we are concerned with public safety," Snarr said. "If protestors are present we instruct our operators to quit working because we don&apos;t want anyone to get hurt." 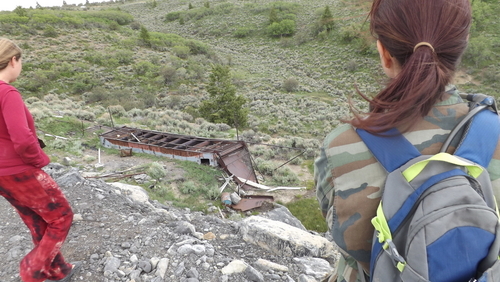 But protestors are spending much of their time exploring, looking for springs and other water sources and studying potential and former mining sites. They point to an abandoned mine called Bryson 4, about a mile from U.S. Oil Sands&apos; test pit, as evidence that industry and the state aren&apos;t capable of managing tar sands safely. Old equipment sits rusting next to an open pit, while tar seeps from piles of rock and pools on the ground. Small animals get caught in pooling tar and die. Because of Bryson&apos;s small size, Utah mining regulators granted an exemption to the usual permits and bonds in the 1980s. The mine has been inactive ever since. U.S. Oil Sands has offered to clean up the site, but no work can go forward without an OK from the owner. Activists also are concerned about the proposed mine&apos;s impact on a beautiful landscape, wooded with aspen and pine and popular with hunters. These lands sustain livestock, horses and wildlife, which can be seen grazing and feeding, sometimes just a few hundred yards from mining areas. 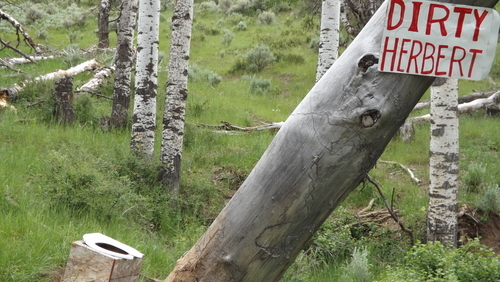 Animals cross roads, enter and exit property without fences to restrict them. "What I&apos;m really trying to prove is that the [Utah] Department of Environmental Quality is not legitimate," activist Raphael Cordray says. "They&apos;re not protecting the environment, they&apos;re not watching out for the citizens. 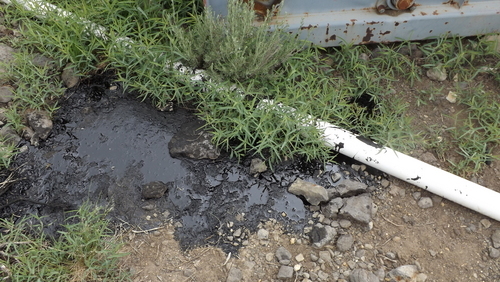 They&apos;re doing the bidding of &apos;Dirty Herbert.&apos;"
In recent years, energy production has ballooned in Duchesne and Uintah counties, putting thousands of people to work, oil tankers on U.S. Highway 40, and customers into businesses in Roosevelt, Myton, Vernal and other basin towns. But fossil fuel extraction, championed by Utah Gov. Gary Herbert, has a dark side, critics say, especially if it moves beyond drilling to surface mining. 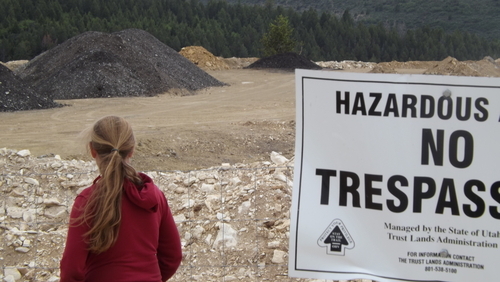 "It&apos;s a boom that&apos;s taking people&apos;s lives," Trepanier says. 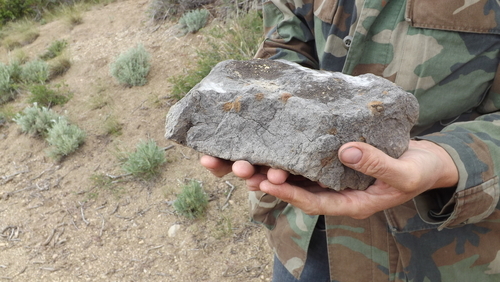 "The short term gain of strip mining the Tavaputs Plateau...[likely] violates Utah law. [The School and Institutional Trust Lands Administration] is ordered to not put short-term interest over long-term interests. That&apos;s what strip mining the land does." So far the group&apos;s relations with the Bureau of Land Management have been cordial and leaders have kept SITLA informed of their activities. "They have been working with us and they&apos;ve been incredibly pleasant," BLM spokeswoman Megan Crandall says. At least seven people were at the campsite June 16, but Trepanier says there could be up to 75 when his group invites the public to participate in various gatherings, including this weekend&apos;s "healing solidarity walk" and last week&apos;s "intergenerational campout." "It gives young people and old people a chance to get together and work on projects and teach each other how to stand up for things that are important to them and how to participate in their community," Cordray says. Calgary-based U.S. Oil Sands says it soon will install mining and processing equipment at this site on state trust lands in the Book Cliffs. Activists camping out nearby hope to block what could be the nation&apos;s first fuel-producing tar sands mine, which would yield a degraded form of heavy oil known as bitumen. State regulators say the 213-acre mine doesn&apos;t require a groundwater permit because there is little water under it. But activists have been collecting spring water here for weeks.